Someone has volunteered to battle Wonder Woman in the role of Cheetah! Jason Statham takes on history’s greatest shark! People are upset with Scott Lang in Ant-Man and the Wasp! And Gambit may be casting another supervillain! 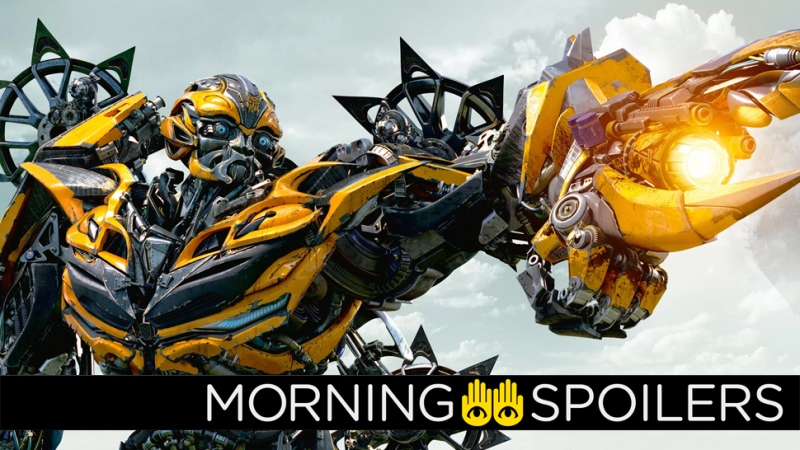 Plus, new images from Pacific Rim: Uprising, New Mutants, and more! All this and our first look at the Thirteenth Doctor, today, in Morning Spoilers! We never thought we’d live to see this day. Empire has an image from the live-action Transformers spin-off movie Bumblebee, where the heroic(ish) Autobot is actually in his classic, original cartoon vehicle form of a yellow Volkswagen Beetle instead of the Camaro he’s been in all the other films. The Walking Dead’s Cooper Andrews, who plays Ezekiel’s loyal and loable knight Jerry, has joined the cast as Billy Batson’s currently unnamed foster parent. That Hashtag Show has a casting call for a character named “Butler” that it speculates could be a placeholder name for Gambit’s romantic rival, Donyell “Bandit” Taylor. Butler: Supporting Character (30-40) Rosa’s fiancé, villain with metrosexual charm. Should be physically imposing. Sarah Paulson recently expressed interest in playing Dr. Barbara “Cheetah” Minerva on Twitter. Empire has the first image from Meg, the long awaited film adaptation of Steve Alten’s best-selling novel that’s been stuck in development hell since 1997. In the film, Jason Statham is hired to rescue a group of scientists trapped in an undersea research lab by the dread Carcharocles megalodon. In another interview with Empire, (courtesy of Comic Book Movie) director Peyton Reed revealed Dr. Pym and the Wasp aren’t exactly happy with Scott Lang following the infamous airport brawl in Civil War. The events of Captain America: Civil War gave us something clear, which is: what was Hank Pym and Hope Van Dyne’s reaction to Scott having taken this technology out into the world in Civil War? We had a lot of fun playing around with that. And we play with size and scale a lot. I love the idea of Giant-Man. Reed also stated that the 30 years Janet Van Dyne spent trapped in the quantum realm may put a strain on her relationship with Hank Pym, which seems... pretty understandable. It’s fair to say if someone were to have spent 30-something years in the Quantum Realm and survived, it would have an effect. What did she eat? All she eats is cereal called Quantum Krispies. Eddie Brock is an incredible character — gritty, real, authentic, funny, but also an embittered character and a truth-teller who has made mistakes. Tom... it’s like a masterclass watching him act every day. He’s such a risk-taker. Both Magick and Mirage get spooky motion posters on the film’s official Twitter. The latest issue of Empire sports a slick new collage promoting Black Panther. Elsewhere, Killmonger threatens to “burn it all!” in a new TV spot. Gipsy Avenger the Jaeger gets its own poster courtesy of Coming Soon. Omega Underground reports Adam Wingard’s Godzilla vs Kong expects to shoot in Atlanta, Georgia. Omega Underground also reports the Goosebumps sequel has officially changed its title to Goosebumps: Slappy’s Revenge, after the series’ cursed ventriloquist dummy. Although planned as a theatrical release, the tenth installment of the Hellraiser franchise is heading directly to DVD/Blu-ray on February 13, 2018. A new piece of concept art from Roberto Aguirre-Sacasa’s Twitter looks as if was torn straight from the comic book. Speaking with Collider, Vincent D’Onofrio stated Wilson Fisk is “evolving” under new showrunner Erik Oleson. It’s hard to top the first season, with Steven DeKnight’s writing, but Erik Oleson is a very good writer. I’ve shot some pretty cool scenes, so far. It’s different, but it’s very Fisk. It’s still very emotional. The character is evolving. His whole deal is based on emotion, so we’re taking him down that role further. Season 11 has wrapped filming, according to Gillian Anderson on Twitter. Finally, Katie Cassidy sneakily stalks Paul Blackthorne in an unintentionally amusing set video.